× ForexBrokers.com helps investors like you across the globe by spending hundreds of hours each year testing and researching forex brokers. You support us through our independently chosen links, which may earn us a commission. This does not impact our completely unbiased research, which is respected by broker executives as among the most thorough on the web. Thank you for your support. The ForexBrokers.com annual review is among the most cited in the industry. With over 60,000 words of research across the site, we spend hundreds of hours testing forex brokers each year. Industry leaders trust us because our rigorous testing is totally independent and 100% unbiased. Trading with a trusted forex broker is crucial for success in international currency markets. As a currency trader or investor, you may have specific needs related to which platform, tool, or research requirements should be met. Understanding your investment style can help determine which fx broker will be best for you. Our team here at ForexBrokers.com has assembled a guide to the best forex brokers for forex and CFDs trading. In each individual summary, we highlight why each broker is worth a consideration. Traders seeking a large selection of instruments and asset classes across global financial markets will not be disappointed with the range of premium services Saxo Bank offers, including research, active trader pricing, and wealth management services that cater to investors’ needs. Saxo Bank was our #1 broker in multiple categories in 2019. Through its offices regulated in major financial centers, CMC Markets offers traders a wide range of offerings across global markets with its Next Generation trading platform, which is packed with innovative trading tools and charting. City Index is a multi-asset forex broker, regulated in the UK and Singapore, that offers competitive spreads across multiple trading platforms. The broker caters to the needs of various clients, from beginners to advanced automated traders, and offers an active trader program for high-volume investors. XTB is regulated in several financial centers, and offers a wide range of markets catering well to traders looking to trade forex, crypto, CFDs, and exchange-traded asset classes on its xStation5 platform and on MetaTrader4, which supports algorithmic trading. When it comes to competitive all-round pricing, CMC Markets took first place as the best broker in the commissions and fees category. With an average spread of just 0.744 pips on its EUR/USD (using September 2018 data), CMC Markets offered the most competitive all-in cost to trade, considering there were no added commissions or fees. Also, the broker’s active trader rebate program helps to round off its ranking. In second place was FOREX.com. During Q3 2018, average spreads for the EUR/USD pair stood at 0.77 pips on the broker’s proprietary Advanced Trader platform, and the extension of its active trader program in 2018 helped lift City Index into third place for Commissions and Fees. 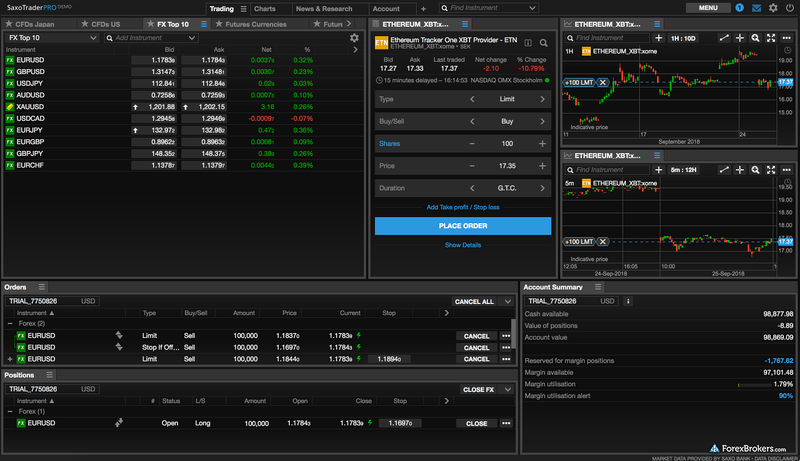 For the Best Forex Trading Platform category, Saxo Bank took the top podium spot this year for its highly refined SaxoTraderGO platform and its new SaxoTraderPRO platform, available for desktop, web, and mobile. Saxo Bank has managed to nearly perfect the user-interface design and user-experience process with news, research, and integrated pattern-recognition, along with syncing watch lists and charts, and responsiveness across devices. Whether trading spot forex or options on FX, Saxo makes it easy for traders to access over 30,000 markets, while providing advanced order types and trading features. These offerings help lift Saxo to first place in this category. Second up on the podium is TD Ameritrade for its highly innovative and rich thinkorswim desktop platform. 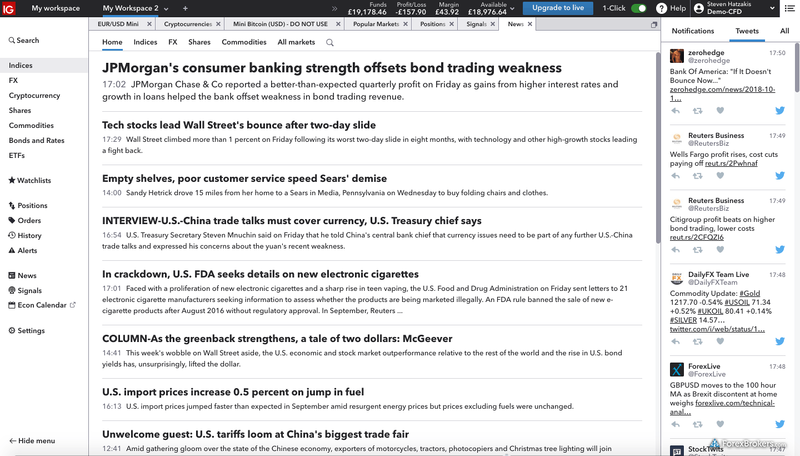 thinkorswim features thinkScripts for algorithmic trading, as well as the ability to create push notifications and alerts on indicators, and even the capability of building custom ones from scratch. thinkorswim offers over 400 indicators – more than any other broker we have reviewed. The addition of a candlestick pattern editor and numerous research and social-network sharing features, along with extremely powerful charting, helped TD Ameritrade advance in this category. IG maintained its first place podium position year-over-year, with 15,000 tradeable instruments available, including 91 forex pairs. It also has the most regulatory licenses among all brokers, including licenses from top-tier jurisdictions such as the US, UK, and Switzerland. IG further extended its US presence by acquiring a Forex Dealer Member license, as it prepares to roll out retail forex to US customers in 2019. In addition to significantly expanding its range of cryptocurrency CFDs, the broker provides access to global stock exchanges through its share-dealing account offering (for more information about IG’s share-dealing offering, read our IG Group UK share dealing review on our sister site, StockBrokers.com). Interactive Brokers (IBKR) took second place with a wide range of top-tier regulatory licenses. Interactive Brokers provides traders access to 6,100 CFDs (up from 4,217), 115 forex pairs (up from 85), global exchange-traded products, US-traded bitcoin futures, and much more, including powerful research tools. 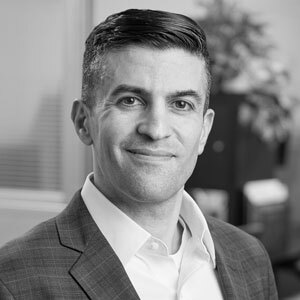 IBKR’s removal of its previously steep minimum account opening deposit (down to $0 from $10,000) was a major milestone in 2018 that enhanced its offering to a wider audience. Saxo Bank maintained its first place position as the best broker for forex research in 2018. While many brokers struggle to organize research for their customers, Saxo Bank does a fantastic job centralizing the research it provides across its platform suite in a clear manner, and within its recently redesigned website, as well as on its Trading Floor offering. Saxo Bank incorporates a social network in which traders share commentary about markets on Trading Floor and provides access to in-house and outsourced research reports, including pattern-recognition tools. Saxo Bank also puts out longer annual and quarterly market research reports and forecasts, including its “Outrageous Predictions” report. IG held its second place position for research, with a broad range of tools available through its web platform and numerous in-house analyst and third-party content. The broker offers its own streaming video, IG TV, along with a vast array of daily blog updates and detailed posts from a team of global analysts. Lastly, the broker’s integration of DailyFx continues to evolve as the site remains a leader for retail traders seeking educational and research content. Twitter feeds stream live within the platform, helping traders access news more readily than via traditional forex news headlines. Dukascopy Bank held its first place position year-over-year, as its J ForexTrader app (formerly SWFX) now even enables traders to run an algorithm straight from their smartphones, which is an industry first. The J Forex Trader app comes with numerous research and pattern recognition features and also includes an impressive array of charting capabilities, complex order types, and other advanced offerings, such as depth of book, all packed into a clean user design. Saxo Bank took second place with its SaxoTrader GO mobile app. 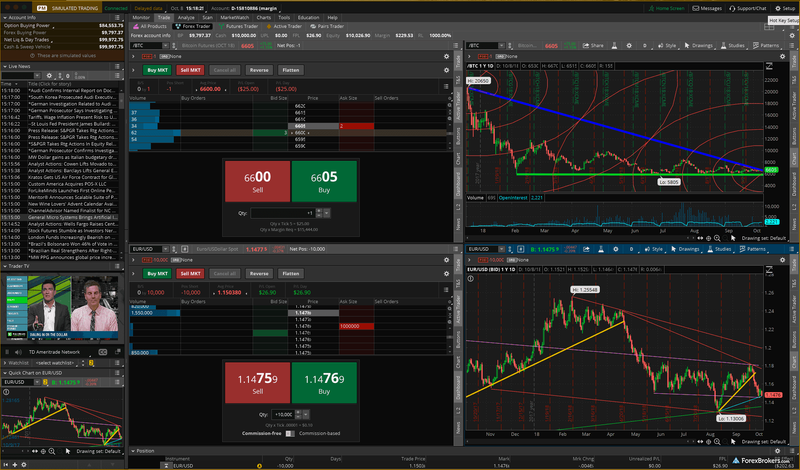 SaxoTrader GO is highly responsive and provides traders a unified experience with its web-based platform, offering unique features such as syncing trend lines, indicators, and watch lists. In addition, the broker’s native integration of trading signals and pattern recognition, powered by Auto Chartist, is also automatically synced with its web platform. Here are some of the most important factors to keep in mind when choosing the best online forex brokerage for currency trading. Regulation: Not all regulatory jurisdictions and licenses are created equal for international forex and CFD Brokers. Investors should know which country their broker is based in and which country’s laws apply to their account, and the regulatory status of that broker. To avoid fraud, it is critical to use a well-known and well-regulated broker. To quickly identify brokers you can trust, reference the Trust Score we provide on each broker’s review page. Company Policies and History: As part of every investors due diligence process, steps to help ensure account security should include verifying a firm’s regulatory licenses and its legal obligations in safeguarding clients’ money. It is also important to review the customer agreements, read up on the company's history, and verify that its primary offices are located in a well-respected country, if not your own. Range of Markets Offered: It is always important to determine which markets or individual trading products (currency pair or stock symbol) you want to trade, then check to make sure they are offered. Also check to ensure the products you want to trade are available in your region. See section, “Best offering of Currency Pairs, CFDs” below. 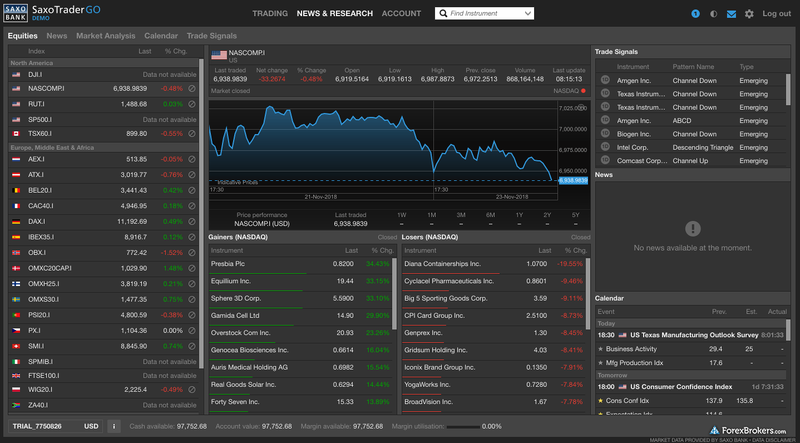 FX Trading Tools & Platforms: Which platforms and trading tools are available for the products you are considering? Are they compatible with your web browser, computer operating system, or mobile smartphone, or any other devices you are planning to use for trading? See section, “Best Forex Trading Platform” below. FX Analysis and Global Market Research: Available research tools for scanning, analyzing, and conducting technical and fundamental analysis will vary from broker to broker. See the section “FX Research” below. Forex spreads, commissions, and overall trading costs: For forex trading, the all-in cost to complete (open/close) each trade will consists of the spreads, plus and any round-turn commissions. The same generally applies to CFDs, in terms of bid/ask spreads plus any per trade commission. See section, “Lowest Trading Costs” below. Order Execution: Available execution methods can depend on whether the broker is a principal dealer acting as a market maker, and/or if they are an agency-only broker relying on third-party dealers (liquidity providers). Other execution methods, policies, conditions, or available order types can vary (including premium or free trade protection tools such as guaranteed stop-loss orders, fill-or-kill or fill within a maximum deviation range) can vary from broker to broker. Order Type and Execution: Some execution methods or order types may incur negative or positive slippage. This means orders will fill but the fill price could be better or worse than that requested. Since each broker is different, some firms may re-quote an order with a new price for you to accept (or reject) in case the price has changed. Customer Service: Customer service is important. The scope and quality of support can be a major differentiator across online FX brokerages, ranging from the speed and overall quality of assistance to availability across global trading hours and international markets. See section, “Customer Service” below. Education: Currency trading can be complex. Even seasoned investors are constantly learning to expand their breadth of currency markets. The disparity between currency brokers that provide thorough, high-quality education and those who do not is vast. See section, “Education” below. © 2019 Reink Media Group LLC.